By now you know what a bad blogger I am, that it has to be a really BIG deal to get me to update my blog. Anyone who's done a Barbie cake for the first time knows what I'm talking about. You can't wait for the party to be over so you can throw a picture up on the web, even if your blog is about books, you will do anything to diverge from the subject and show your Barbie cake to the world. 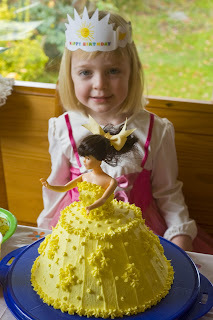 There are dozens of websites chronicling the trials and tribulations of doing a Barbie cake. This is just my proof that if I can do it, you can to! All it takes is about $60 of upfront supplies (you could do it for less, but if you are like me and have fear of failure, you will buy more supplies than you need) a night to bake and then the next night to decorate. Give not up if the first hour of decorating leads to a steady strain of self recriminations of the "why did I decide to do this" and mental comparisons to the much better cakes your mother made for you. Persevere! It's a wonderful way to celebrate a four-year-old's birthday. To get full value out of the mold though, husband and other daughter can expect the same cake on their birthdays for at least the next twenty years. I look forward to a posting of Dave's birthday Barbie cake! :) Wonderful job, my friend - how very Victoria of you (note that I've inserted Victoria where many would insert Martha Stewart). That's an outstanding cake and a very satisfied customer! Lovely photo.